The tragedy that unfolded in Charleston this week is practically beyond words: a racist gunman committing what can only be described as an act of terrorism, taking the lives of nine people who had just invited him into their bible study community. Many people have spoken much more eloquently than I’m capable of about the white supremacist system that allows, encourages this kind of violence. Because yes, as horrible as these murders are, they are best understood as a symptom of a larger environment than some terrible anomaly. And other symptoms are less obvious, but profoundly tragic. 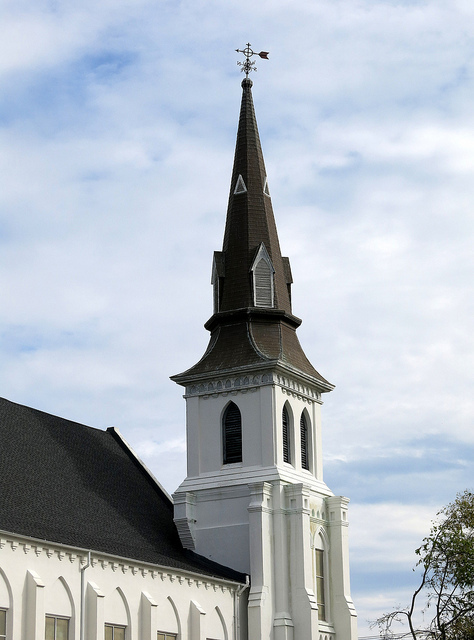 “The steeple of Emanuel African Methodist Episcopal Church, Charleston, SC” by Spencer Means is licensed under CC BY-SA 2.0. Wikipedia articles are, for better or for worse, a metric with a disproportionate impact on people’s perception of what is valuable. Thanks to its aim to be an encyclopedia of all human knowledge and its ubiquity at the top of search results, many people use it as a shorthand evaluation of importance. This isn’t a new observation—the organizers of the Art + Feminism Editathons, for example, have pointed to studies about how article lengths reflected gender bias on the site. Before Wednesday’s shooting, the Emanuel AME Church in Charleston had no Wikipedia page. It’s a monumentally historic place—the oldest black church in the south, co-founded by Denmark Vesey, and has hosted the likes of Booker T. Washington and Dr. Martin Luther King, Jr. And yet, its absence from the Wikipedia belied that significance. Worse, it has knock-on effects: journalists absolutely refer to Wikipedia articles to quickly get up to speed on issues, and pundits look to it for context. The history of racist violence at Emanuel AME is critical context to this week’s news, but to Wikipedia readers it might as well have not existed. Putting the page together was one way I that could contribute positively to that conversation, and—importantly—that I could do so without centering my own voice. Wikipedia authorship is imminently knowable but generally unknown. On Wednesday night I started the article and asked on Twitter for people to help. Really, my contributions were minimal—I started a stub, found a picture, and put in some references. Over the last two days, over 40 different people have made over 150 edits to the page, and it is now a real and impressive article. Peter Murray, a library technologist in Columbus, made this amazing visualization of the page’s growth over just a few days. It’s not there yet, but it’s getting to be the article that such a beautiful and historic site deserves. And in the last two days alone, the page has been viewed 36,000 times. This stuff matters.